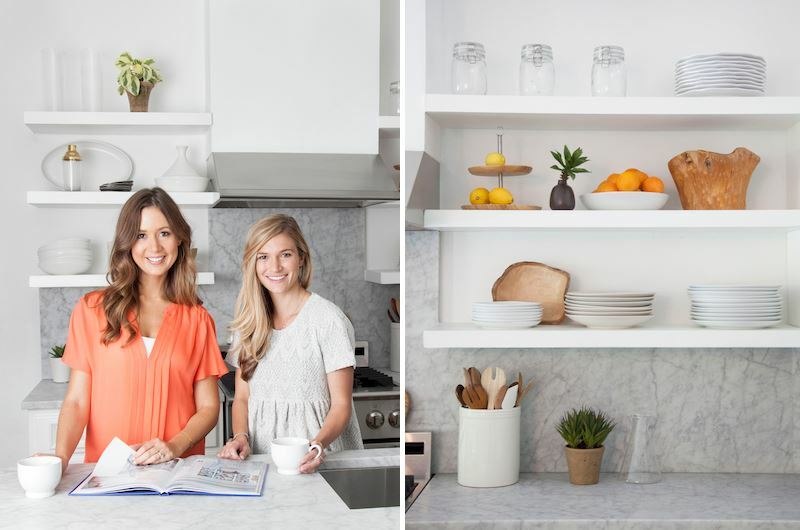 To create the kitchen’s classic, modern look, Camille worked with interior designer Claire Zinnecker. 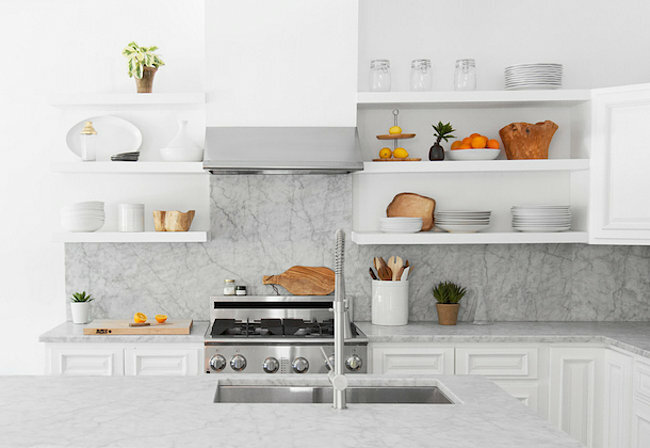 From tearing out cabinets and replacing them with floating shelves to carefully crafting a sleek blend of marble and wood, the design updates created a chic, earthy vibe. 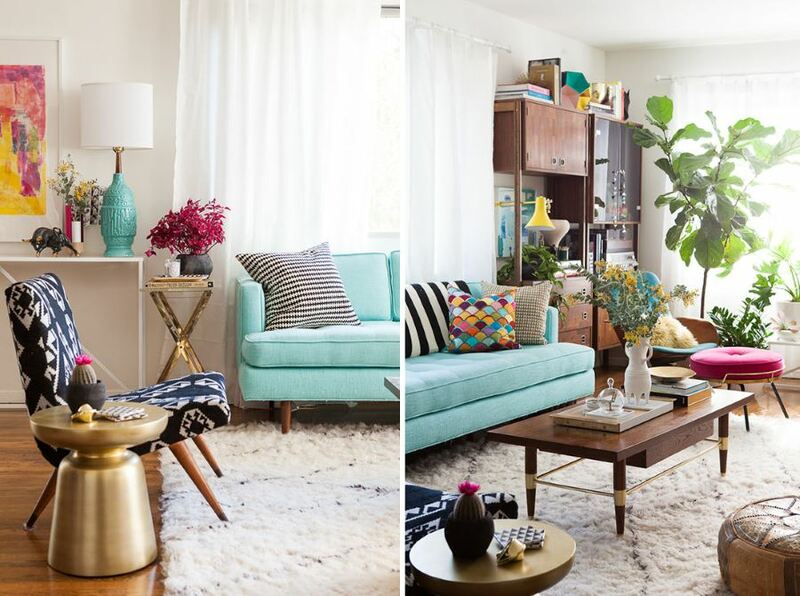 We’re loving: THE “MIXED MATERIALS” LOOK. By grouping like items, a carefully curated display was achieved, and the contrast between white marble and earthy wood is nothing short of stunning. 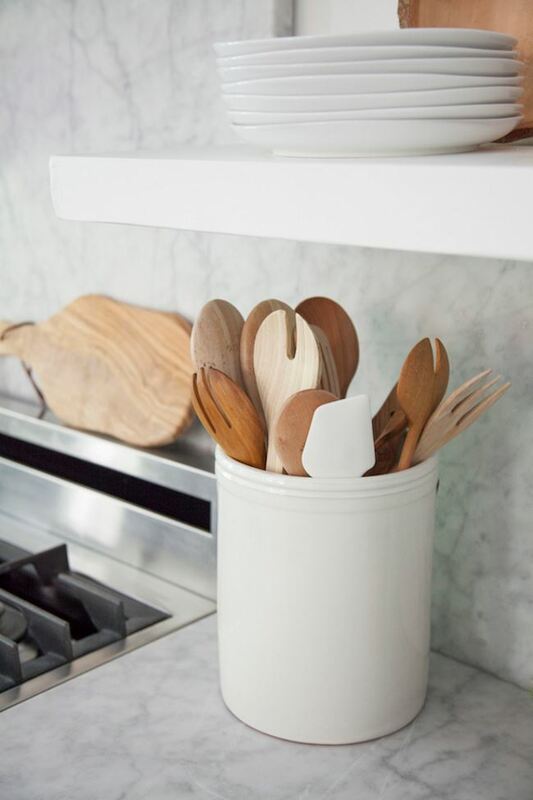 Learn more about how Camille Styles organizes her studio here. 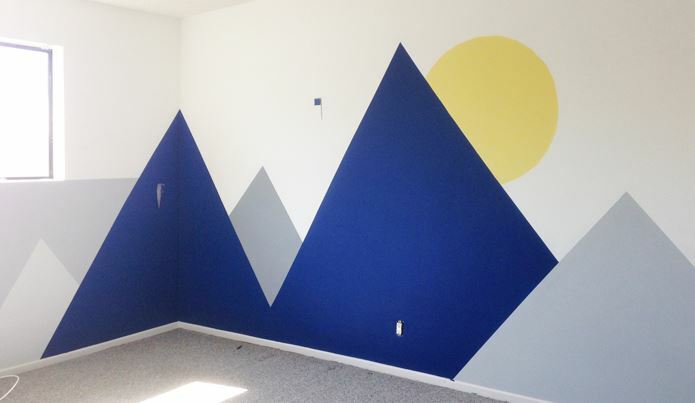 This bedroom makeover was completed on a budget of $1,200, thanks to Mehlhoff’s creativity and strategic use of DIY projects. 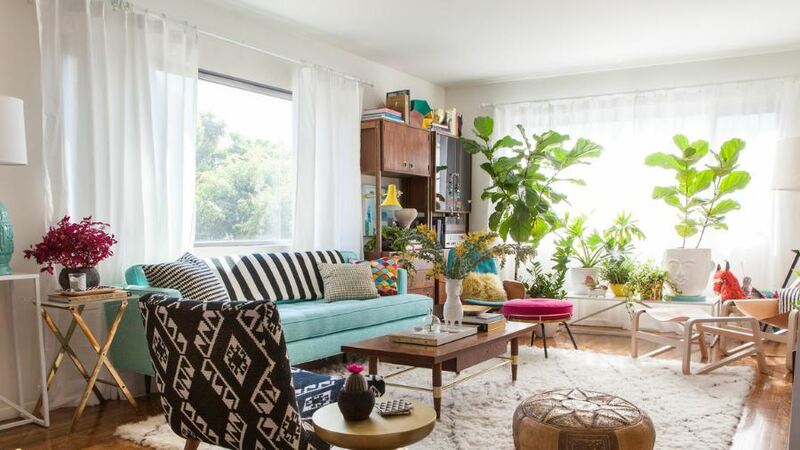 The space is infused with bright pops of color, and plants add a welcoming touch. You can read even more about this project on Curbly. 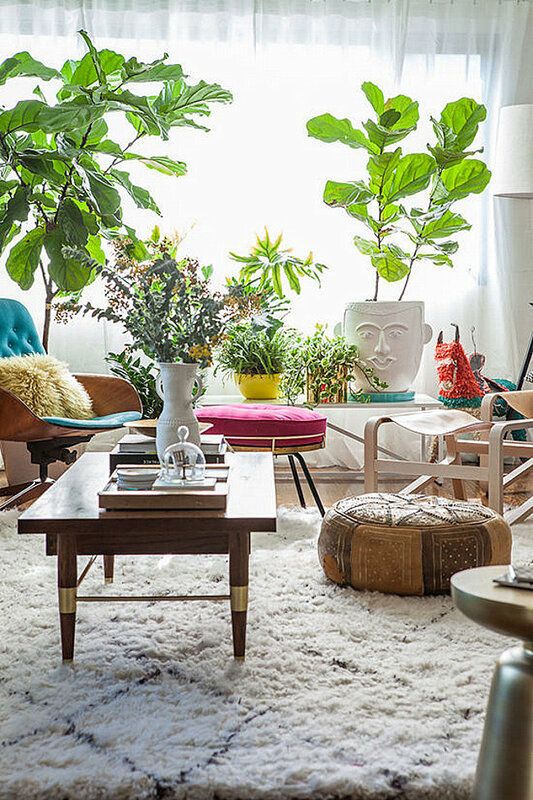 We’re loving: THE VINTAGE STOOL MAKEOVER. 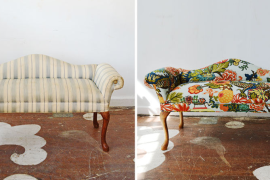 The vintage footstool below was brightened by a coat of cheerful yellow paint and a quick reupholstery job. 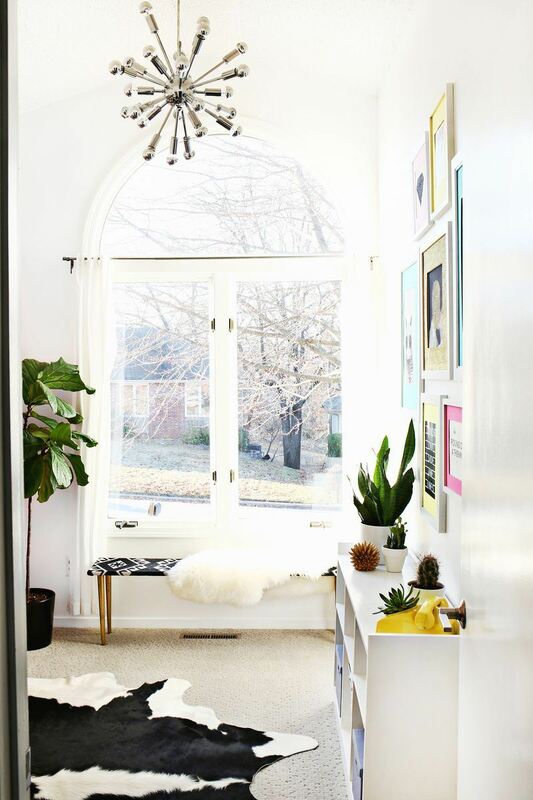 It’s the perfect special touch to a space that should absolutely be all about fun accents and decadent additions! Plus, this stool makeover is a great reminder to all of us that vintage pieces are a wonderful place to start. 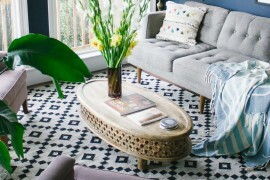 Giving them a modern update is a budget-friendly way to create truly unique finished products. 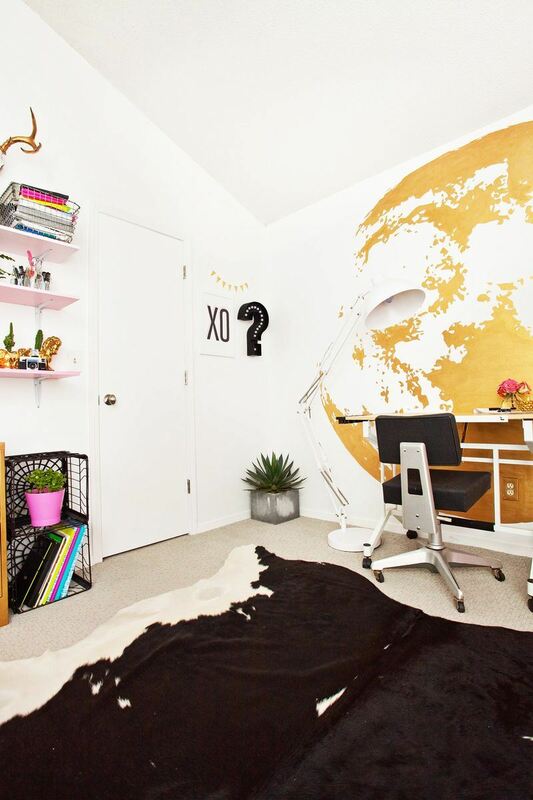 We’re loving: THE WALL MURAL! How amazing is it?! Below we see a photo of the mural in a near-finished state (hot pink details were later added to create a snow-capped mountain effect). The best part: you can read all about the painting process here! You know, in case you want to create your own awesome wall mural at home. Creative spaces in the home are a growing phenomenon. 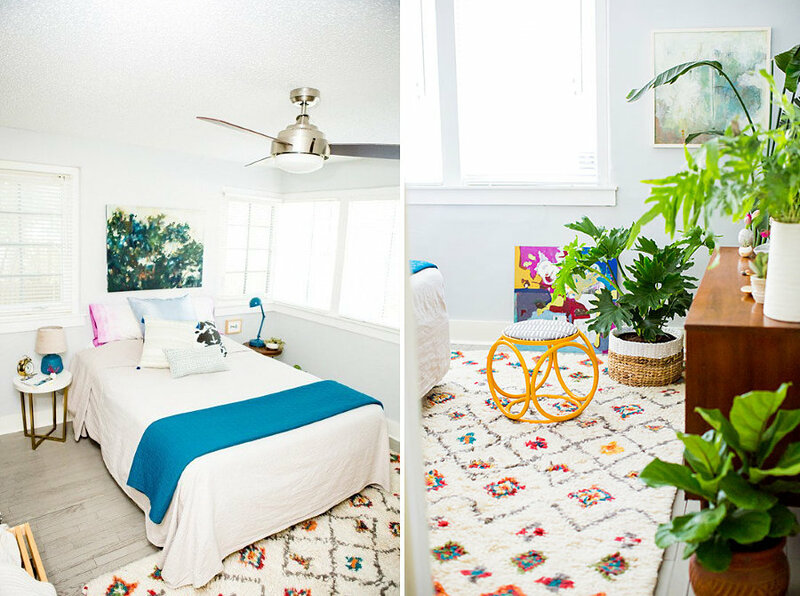 This art room makeover from Laura Gummerman of A Beautiful Mess gives a practical space a glam-eclectic upgrade. 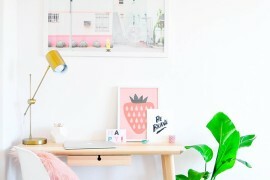 The first thing that caught my eye: that fabulous pendant light! 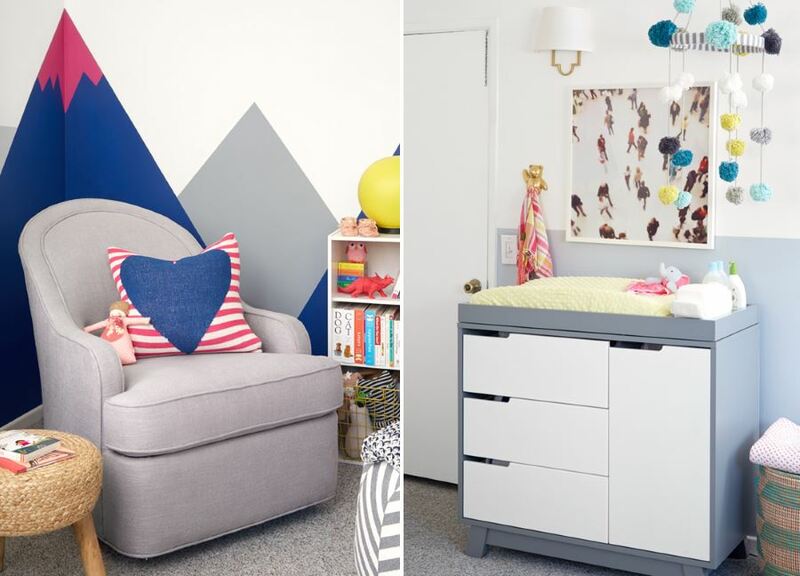 But at a closer glance, it becomes very clear that this room is filled with an array of unforgettable details, including numerous DIY projects. The gold moon wall below is undeniably awesome. 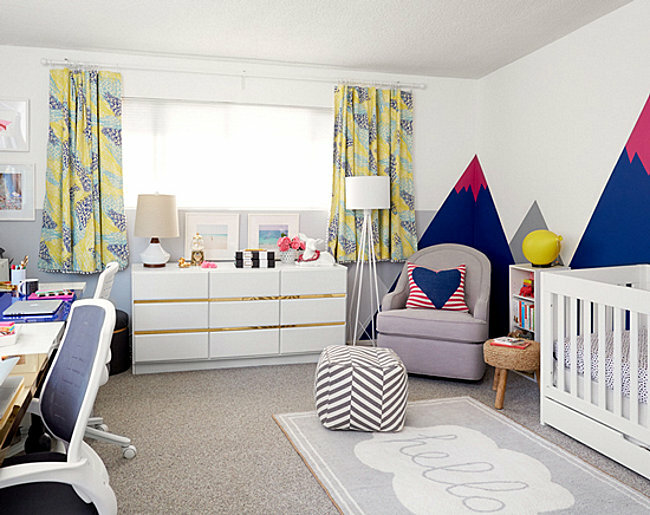 Check out the full art room makeover post at A Beautiful Mess. There are definite details you won’t want to miss, like a pink set of lockers and some fun planters. 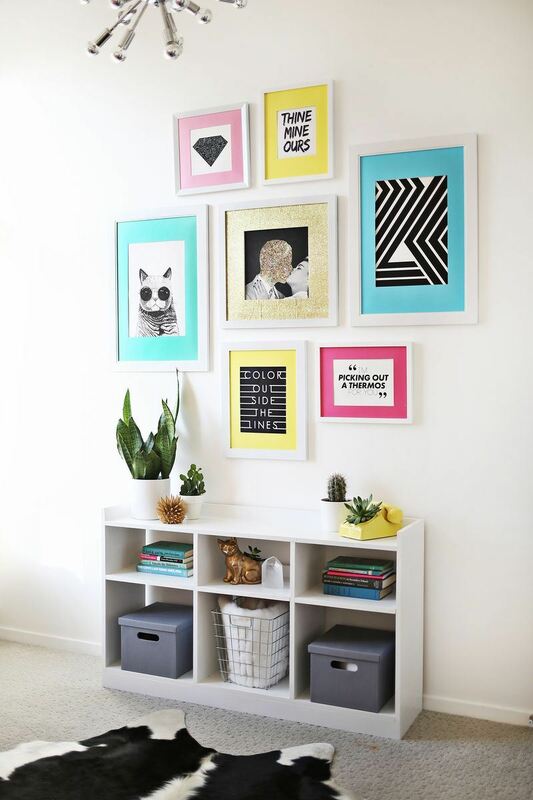 We’re loving: THE COLORED MAT GALLERY WALL. With colorful card stock or mat board, you can add a punch of personality to a framed grouping of your favorite images. 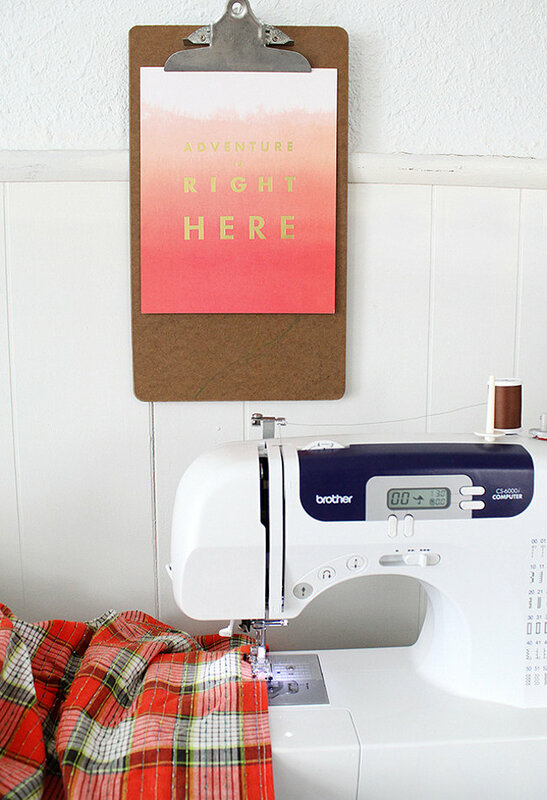 Luckily A Beautiful Mess has a handy tutorial to help us all create our own! Special touches like a spool holder and a duo of quirky dolls add personality. 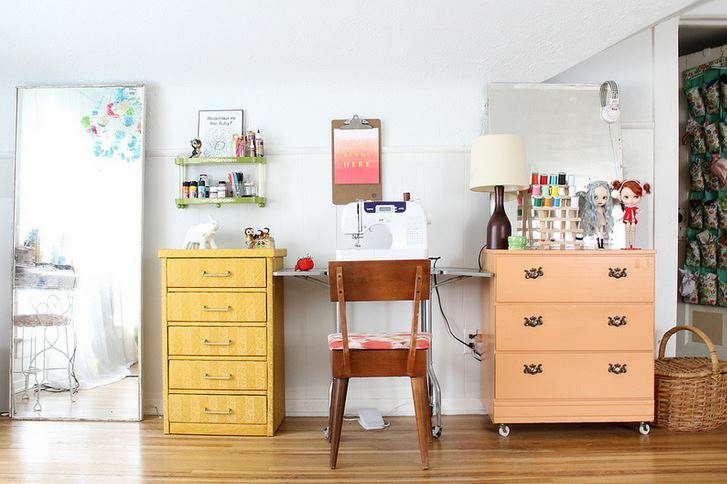 Not to mention, plenty of drawer space is essential for holding sewing fabrics and supplies. 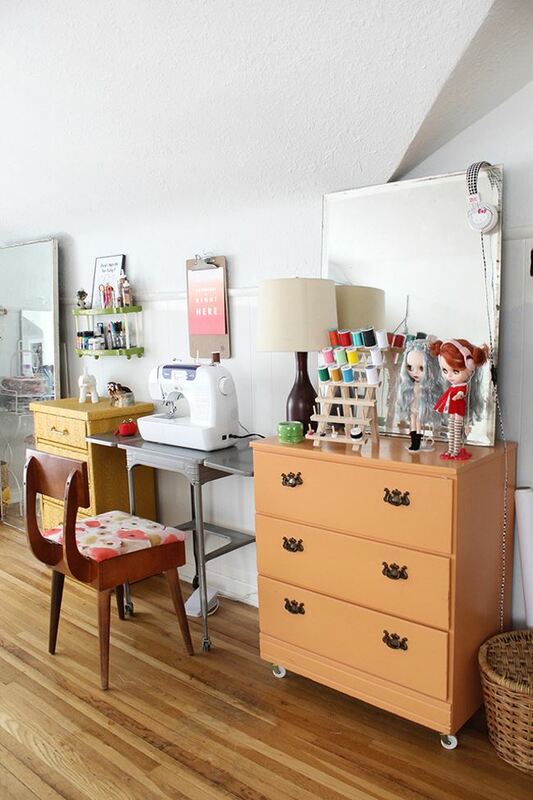 View additional images of Katie’s sewing area at Skunkboy. We’re loving: THE CLIPBOARD “FRAME”. Because it’s affordable. Because it’s whimsical. Because it’s easy to hang on the wall. And because it’s holding an awesome piece of ombre artwork with a motivating message! Are you tempted to use a clipboard to “frame” your favorite piece of art? 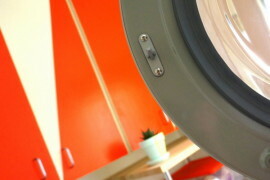 Did you notice that all of today’s room makeovers feature light-colored walls as the foundation? 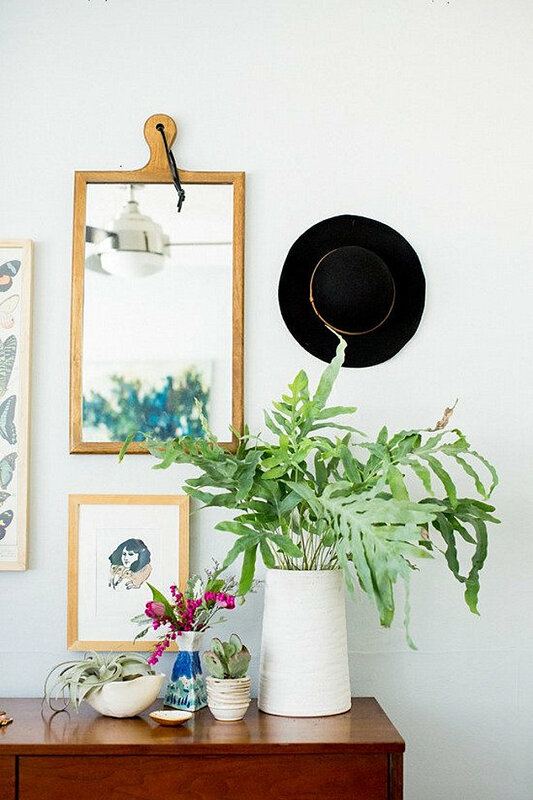 Plenty of radiant details are scattered throughout each space, and ample greenery is a popular accent in multiple rooms. Not to mention, each and every space reflects the creativity of the people who inhabit it. Feeling inspired? I know I am!